PRODUCT DESCRIPTION: Available in Black, Grey, White or Brown these are automatic vents which open and close to control air flow in crawl spaces. They come with a lifetime warranty and will open and close so you don't have to worry about doing it every change of the season. Basically they are powered by an expanding and contracting spring. The spring contracts when its cold which in turn closes the vent; it expands when its warm which in turn opens the vent. WHERE TO USE IT: Any crawl space. Simply fit it where the old manual vent was located or knock out a cinder block and fit the Temp Vent into this new hole. These vents measure 8 inches tall and 16 inches wide and have a 1 inch frame that goes around the outside to cover any gaps that might be present when inserted into the empty hole. 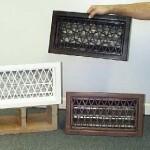 Each vent comes with mounting hardware to provide a snug fit. PLEASE NOTE WE ALSO SELL THE POWER VENT WHICH IS ESSENTIALLY THE SAME DESIGN BUT IT HAS A MOTOR BUILT INTO THE BACK OF THE VENT WHICH POWERS A FAN FOR RAPID AIR DISPLACEMENT. RATE OF APPLICATION: As a general rule, crawl spaces should have one vent every 10 feet of foundation wall but this will vary depending on the needs of the space needing ventilation. Since these are designed to accept paint, its quite common to paint over them once installed so if you are not 100% satisfied with the "match" of your paint and Temp Vent color, just paint over the vent. 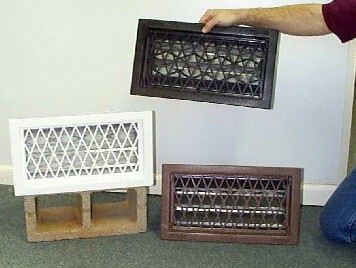 These vents are also available in BLACK, BROWN and GRAY. These work by the expanding and contracting of a coiled spring which is built into each vent. Basically the spring contracts when its cold and as it contracts, the vent will close. This happens somewhere in the 40 degree range. But as the temps warm to 50 and above, the coil expands which in turn opens the vent. All this is done automatically; no batteries or external power is required.